In 2014, as part of President Obama’s efforts to normalize relations between Washington and Havana, the importation of Cuban cigars into the U.S. was partially legalized—only for officially licensed travelers to Cuba, and only if the value of the cigars (and rum) totaled $100 or less. Later, in March 2016, the $100 limit was eliminated, and the legalization was expanded to include the importation of Cuban cigars that were bought in Cuba or elsewhere overseas, as long as the cigars were for personal consumption. However, as we reported last fall, Cuban cigars still cannot be imported to the U.S. unless you are personally traveling with them. In other words, online sales of Cuban cigars to American residents are still illegal. Aguila was launched in October 2016 in three formats: Robusto (4.9 x 50, $47 per box of 10), Sublime (6.5 x 54, $49 per box of 10), and Torpedo (6.1 x 52, $48 per box of 10). The tobaccos include an Ecuadorian wrapper, a Jalapa binder, and long-filler from Estelí. 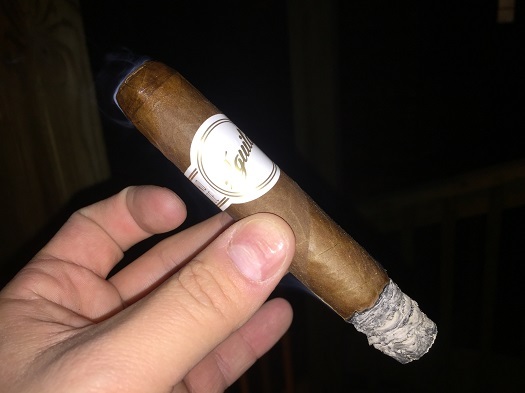 I smoked five Aguila Robustos for this review. The understated, elegant ring band of white and gold reminds me of another brand made by a company headquartered in Geneva: Davidoff. Beneath is a milk chocolate-colored wrapper that has only very thin veins, thick seams, and a moderate amount of oil and tooth. The feel is on the spongy side. Pre-light notes at the foot remind me of dried apricot, hay, and musty earth. At the outset, a mild- to medium-bodied profile emerges with flavors of cinnamon, cedar, cream, and a cherry-like sweetness that, at times, verges on medicinal (think cherry cough drops). Cinnamon and cedar are sensations we all associate with spice, but in this case the spice is incredibly light. The texture of the smoke is somewhat sandy. After about an inch, a core of warm tobacco comes to the fore. Here, the sweetness is still playing a notable role. The finale is characterized by few flavor changes but a marginal increase in intensity. The physical properties leave little to be desired. While the burn can get off to a poor start, it quickly self-corrects and then stays straight until the end. The draw is smooth and the smoke production is above average. The ash has a tendency to fall off a little prematurely. For $4.70 per cigar when bought by the box of 10 (inclusive of shipping, mind you), the Aguila Robusto can be a nice little bargain for those who seek a low-cost, everyday cigar that packs considerable sweetness and feels at home in the garage, out on the yard, or on the golf course. It lacks complexity and balance, but I don’t think it was ever intended to be a special occasion masterpiece worthy of your undivided attention, either. In my book, this creation from iHavanas is worthy of three stogies out of five.